Mr. Great Lakes (Jeff Kart). As heard in Bay City, Michigan, at 9 a.m. Fridays on Delta College Q-90.1 FM. From Chapter 18 of the National Climate Assessment draft. 1- The Michigan Waterfowl Legacy program now includes Saginaw Bay. Michigan Waterfowl Legacy is a recently launched statewide initiative that seeks to bring hunters and non-hunters together to restore, conserve and celebrate Michigan’s waterfowl, wetlands and waterfowl hunting community. The Legacy is a 10-year, cooperative partnership between various government agencies and non-government conservation organizations — including the Bay City-based Saginaw Bay Watershed Initiative Network. The Saginaw Bay watershed is the largest in Michigan, draining about 15 percent of the state’s waterways. Goals of the Legacy program here include increasing the number of citizens in the region who are using and enjoying wetlands, and building on successful partnerships that have resulted in increased wetland and waterfowl habitat. Plans include the promotion of Saginaw Bay tourism opportunities related to waterfowl and wetlands, and the development of Saginaw Bay-specific Michigan Waterfowl Legacy events, such as waterfowl hunting, birding, and trapping workshops. The project has been funded by a $27,500 grant from the Saginaw Bay Watershed Initiative Network, supported by area foundations. 2 – A bioreactor project is planned for a Midland landfill. The city of Midland is requesting a construction permit from the state for a research, development, and demonstration project at an existing solid waste landfill. According to a permit application, on file with the Michigan Department of Environmental Quality in Bay City, the project is designed to study the effect of adding sludge from the wastewater treatment process to solid waste at the landfill. Adding sludge to the landfill is expected to optimize conditions for the biological decomposition of solid waste. The landfill is 340 acres, and located on East Ashman Street in Midland. The project also could increase the life of the landfill, and the amount of electricity generated from existing landfill gas extraction equipment. A decision from the DEQ is expected by late April. 3 – Climate change is already impacting wildlife in Michigan. Case studies from across the country show that global warming is altering wildlife habitats, according to a new report from the National Wildlife Federation, covering eight regions of the U.S. Highlights from the Great Lakes and Midwest include: More heavy rainfall events are increasing runoff of nutrients from agricultural lands, contributing to harmful algal blooms and causing oxygen-depleted dead zones in the lakes. The report recommends action to reduce the amount of toxic pollution from coal-fired energy, and support for more wind, solar, and geothermal energy projects. Meanwhile, a recently released draft National Climate Assessment from the federal government concludes that climate change will lead to more frequent and intense Midwest heat waves, while degrading air and water quality and threatening public health. Intense rainstorms and floods also will become more common, and existing risks to the Great Lakes will be exacerbated. 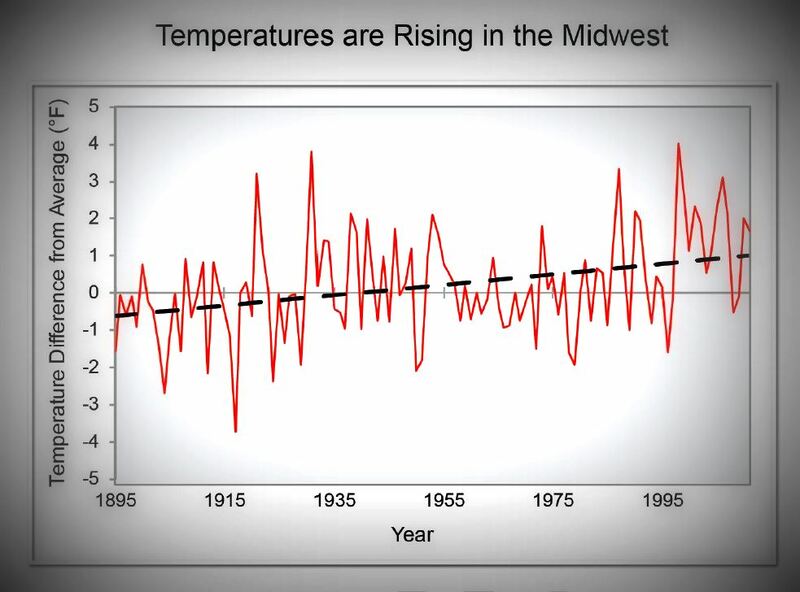 The National Climate Assessment’s Midwest chapter (pdf) was authored by three University of Michigan researchers.